What better way to celebrate Easter, than with a delicious tasty sweet treat and sharing the joy with loved ones. 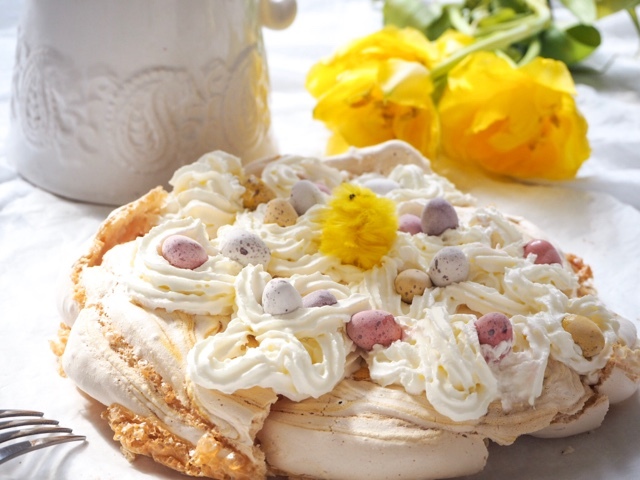 My Easter Meringue Delight is perfect for parties or a sweet treat after lunch or dinner and what better way than to share it with family and friends. 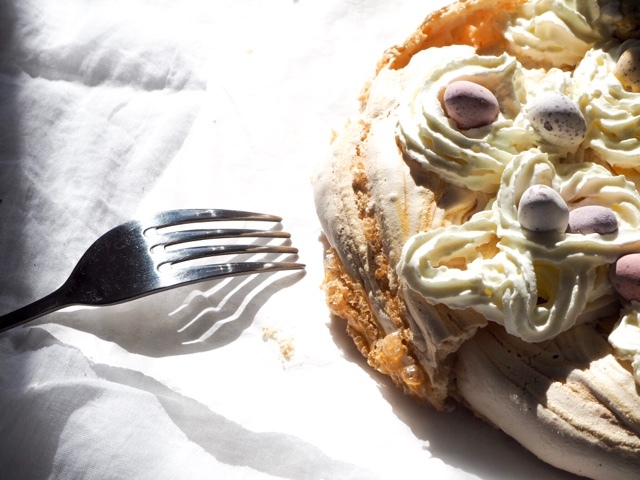 Leanora and I have been whipping up a storm and leaving the kitchen in need of a revamp, all in aid to create our scrumptious Easter Meringue delight. It was my first ever time making a Meringue and after going through over a dozen eggs, on the 6th try, I've finally cracked it! Yes and eggcellent pun! For me I want to create memories, be it a family Easter Egg Hunt or starting a family tradition now that I have my very own, something that each year I and Leanora too can improve and perfect and hopefully, pass on from generation to generation. And what better way for me to start, than with something totally new that I have made with my little Leanora. 1. Heat oven to 140C/120C fan/gas 1. Line out a sheet of baking parchment on a baking tray. 2. In a clean bowl, whisk the egg whites until very stiff (I learnt the hard way and thought I could be slick by doing it by hand!) The egg whites should stand stiff, not floppy, peaks when the beaters are lifted out. Once you have reached this point, pour in half the caster sugar and the vanilla extract and whisk again until the mixture becomes very thick, firm and shiny. Add the remaining sugar and whisk again until thick, firm and shiny. 3. Grab a spatula and in a circle add a dollop of the firm meringue on top the parchment paper (I did not have a nozzle bag, thanks to L taking it into the garden earlier and filling it with soil, then trying to feed it to the Cat/Milo) once all dolloped on top, grab a fork and add in your swirls. The meringues will spread slightly as they cook, so leave enough space between each one. Bake in the oven for 1 hr, turning the heat down to 120C/100C fan/gas ½ after 30 mins. Before placing in, I did add a drop or two here and there of yellow colouring and once swirled the colouring came up prettily and perfect for an Easter table. 4. Remove from the oven – your meringue should peel easily away from the parchment, then leave to cool on a wire rack. I would like to say I made my cream, but that's a lie, I used shop bought in a can and squeezed in circles like a mad woman and popped on top all around some mini eggs. 5. 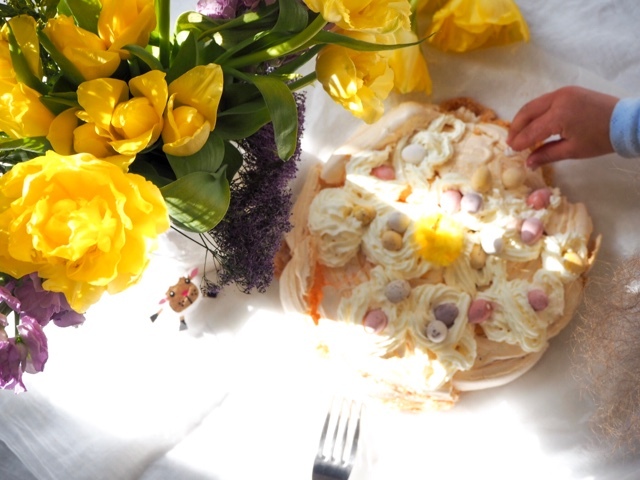 There you have it an eggcellent sweet Easter Meringue Delight for you and your family and friends to enjoy. Do you have any Easter traditions or dishes that you make each year?